Something I find annoying about the accordion widget is that I can't have more than one active section. If the application has vertical space constraints, maybe having only one accordion section active at a time makes sense. 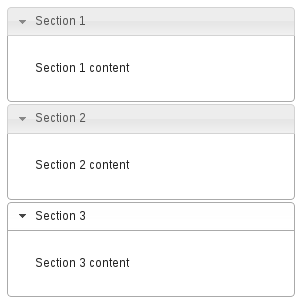 But as a user, I generally want more than one section open at once. This isn't offered out of the box with the jQuery UI accordion widget. This capability is not the intent of the accordion. But, it's not too difficult make it happen. Here is my attempt at an expandable accordion. // widget since they're "static". // Called when a section is expanding or collapsing. // Not expandable, do nothing. // This forces _toggle() to use the oldPanel argument. // panel is the one we're collapsing. // The section is collapsed. We're expanding. // The new panel is the one we're expanding.